Hashtags are to the social web what emoticons were to Web 1.0 and TXTing. While both are forms of expression and sentiment, there is one subtle, but vital difference. Hashtags are not only part of online culture, they are defining a new era of communication on the Web and IRL (in real life). With over 140 million Tweets flying across Twitter every day, hashtags surface a method to the madness — the ability to group conversations into an organized timeline. But what started out as a way to index conversations in Twitter has now substantially altered how people convey, relay and discover information in and out of the popular nichework. The hashtag has also a form of #selfexpression. In social media, “x” no longer marks the spot, “#” is now the indicator for popular culture and all that moves it. In the social economy, the hashtag is an indicator of value in the Twitter information exchange. Each hashtag represents revolving markets with varying lifespans determined by the significance of the conversation and its continuously fleeting demand. Some last only minutes, while others endure for hours or days. While many struggle to understand the value of Twitter, those who get it are literally changing how they connect and talk to one another. At some point, a chasm emerges between those who use Twitter and those who do not. In other channels where Twitter users and other non-users are connected, for example email or text messaging, the culture of conversation becomes noticeably divergent. To begin with, Twitter users, like txters, are groomed to speak with brevity. Subconsciously aware of the character constraints of Twitter, communication is concise, to the point, with an emphasis on shortform bursts. This digital shorthand if you will is only part of what’s changing. Digital anthropologists have long observed the impact of text messaging on the ability to write in longhand. R U surprised? Prolly not…LOL! Twitter will also become the subject of educational studies to prove that the culture code of communication is transcending status updates to affect everyday engagement. Specifically within 140-character inspired transmissions, the hashtag is playing an important role. The Tweet led to a series of conversations within the Twitterverse with thoughts from the likes of Stowe Boyd, Chris Heuer, Stephanie Booth, Brian Oberkirch, among many others. I too joined the conversation, stating that #hashtags would create channels that “will improve the Twitter experience.” At the time, the ability to search Twitter was in its infancy with Summize, later acquired by Twitter, providing the ability to surface relevant conversations. Unlike Groups, hashtags were meant to organize conversations in the stream. The introduction of the “#” also introduced a psychological phenomenon where people consciously injected a word or expression that indexed the Tweet and ultimately entire threads. Messina’s Tweet, his published work, and the ensuing community dialog and collaboration helped to solidify the hashtag’s position in the Twitterverse with almost equal status of the now pervasive “@” symbol. In its own right the “@” is now officially the universal symbol for engagement which extends well beyond Twitter. It’s now the standard engagement in Facebook, email, and any digital conversation thread. But back to the hashtag. What started as a form of indexing later evolved into a form of declaration, sentiment, sarcasm, inner monologue, or subconscious, but stated, expression #thinkingaloud. Hashtags have also had a cultural impact on society. In March of 2009, I ran a live experiment at DEMO and SXSW to see what would happen if I introduced a real-life hashtag moment into the flow of everyday conversation. For example, if I were to make a statement, I would end with an emphatic point to classify the conversation or to express an intentional undertone. I would then cross two fingers on top of each other in the form of hashtag to see how people responded. In every case, people reacted immediately with “HASHTAG! 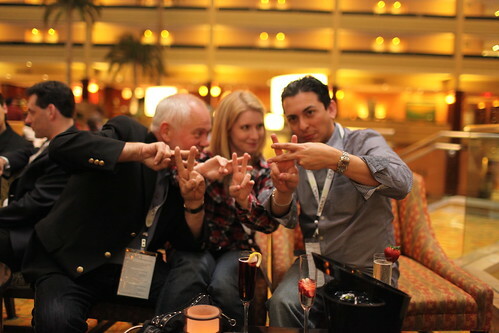 A gang (hand) sign for social media!” Like popular RT memes on Twitter, the hashtag hand sign flew across the social web fueled by twitpics of what would eventually become the calling card of the “Hashtag Mafia.” #brilliant. In the days leading up to SXSW 2009, the hang sign officially made the SXSW Bingo card. Today, the hand sign is part of Twitter culture, flashed by the Twitterati in daily dialogue. Hashtags are evolving and as such, continually attract studies. The New York Times investigated the marvel of hashtags and for the most part, captured the essence of this powerful expression mark. However, there are also parts of the discussion that equally miss its brilliance. For example, comparing hashtags to “air quotes” is oversimplified. The psychology behind it is incredibly deep, diverse and worthy of study as is the sociology of Twitter’s mircro global community. Ashley Parker, the author of the article, inexactly classifies the hashtag as Twitter’s secret handshake. In fact, it is nothing less than Twitter’s signature. It is the equivalent of punctuating a thought or experience. Hashtags are no longer bound to Twitter. They traverse the channels for all forms of communication. Hashtags are now embedded in the fabric of our digital lifestyle and enlivened in our expressions. Although the value of hashtags are in the eye of the beholder, they are special. As such, they are not easily manipulable. Hashtags must possess cultural relevance to connect at an intellectual or emotional level before they can trigger the A.R.T of social media (actions, reactions, or transactions). Hashtags aren’t to be branded, they are to to be relatable. #hashtag that!